Our land Rover has a few problems. 1. It says that the bonnet is open when it's not. 2. After putting in new brake pads and sensors it won't go into drive. The shifter won't click into place. Any advice? Thanks! 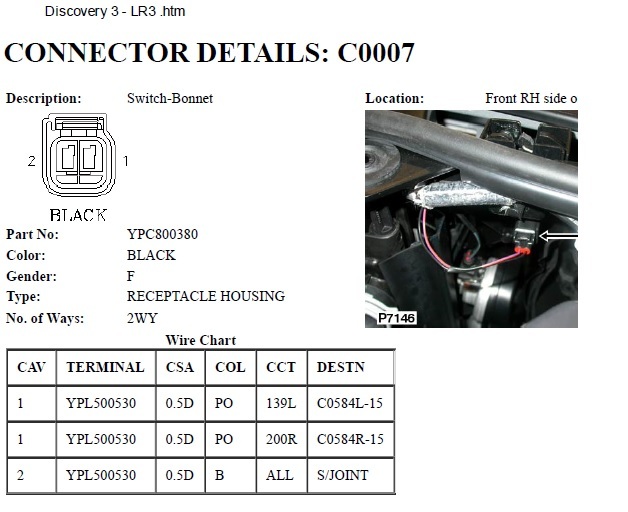 There is a latch sensor(switch) for the bonnet (hood) that may need adjusting or replaced. Also you may have issues with the alarm caused by the bonnet sensor. On the brake system, it may be the pedal switch or something simple. When the brake is depressed, the switch engages and release the shift mechanism. I can't imagine any relation between brake pads and sensors and going into gear. Front brakes? Only a sensor on the drivers side and there are a couple other wires in the area where it connects to the harness. Something else bumped?????? The hood switch is located on the passenger side hood latch and is a serviceable switch. As a quick test of the circuit, you can disconnect the wiring plug and cross the connections (a paper clip works) this is a grounding circuit so no danger of hurting anything. Dash warning should go off. Any other fault messages on the display? Thanks for helping. It might have something to do with hill decent control. It will lock into reverse but not drive. Also, I still can't fix the bonnet is open. Would you be able to share a video or pictures? Do you have operating brake lights? These vehicles have a solenoid that when closed, locks the gearshif into park. It's controlled by the brake light circuit. Not sure on this specific truck, but some will go into neutral with the key in first unlocked position, which is wheel unlocked, nothing on. There also may be a manual release. The older Rovers required the plate below the shifter to be popped up and the solenoid manually disengaged. Check your manual for the release procedure.